You will get the high quality products that we're proud of as well as technical and any other support you may need when using our amps. The new numbered series Bootlegger & Ashen 210 Pine Blues 30 Combo. Our Bootlegger Blues 30 screaming all tube amp with two 10" Ashen Speacial Design custom USA speakers. New design custom one-of-a-kind cabinet also built by Ashen Amp. Hand made in the USA out of artistically stained pine with use of other kinds of wood for front and back panels. Each Bootlegger/ Ashen Blues 30 combo will be a unique piece of art. * 30 lbs light - compare to any other amp in its class. This little combo will surprise you by it's big sould and power. 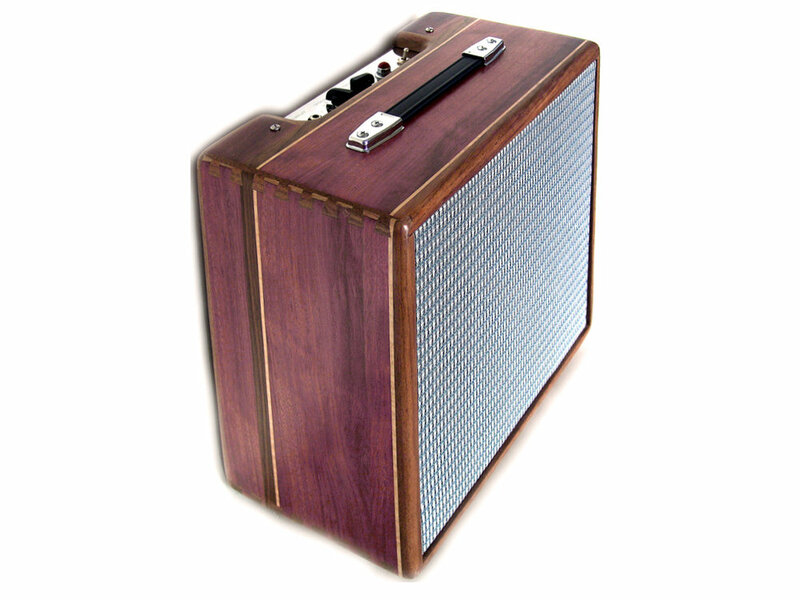 The unique custom built enclosure created using Purple Heart wood layered over pine is sturdy and beautiful. You can order enclosure for your own custom made Bootlegger Blues 5 or 30 Guitar Tube Combo with your desirable choice of wood or combination of finishes. Just contact us to find out options and pricing.